The French town of Saint-Étienne was a well known center for textiles from the 11th century and of arms manufacturing from the 16th century. The river Furan runs through the town and provided the power for textile mills, metal smiths, arms smiths, and gunsmiths. Industrial expansion in the 19th century was accelerated by coal mining in the region. On 10 November 1885 an existing company in Saint-Étienne, the Manufacture Française d’Armes et de Tir, was purchased from Martinier Collin by Pierre Blachon and Etienne Mimard and was renamed by them to Manufacture Française d’Armes de Saint-Étienne. In 1892, as bicycles became a major product line, the company was again renamed to Manufacture Française d’Armes et de Cycles de Saint-Étienne, and became a limited company under the name Manufrance. 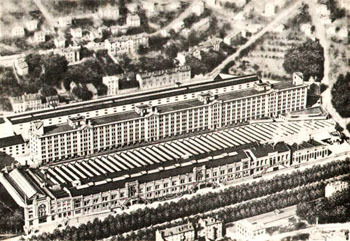 Sometime in this period a large factory was built in Saint-Étienne. By 1898 the company had 1000 employees. The Manufacture Française d’Armes et de Tir had manufactured primarily shotguns, rifles, and military revolvers, but the new company quickly expanded into bicycles, typewriters, and sewing machines, and also became a distributor for other company’s wares, including guns made by the major manufacturers in both the U.S. and Europe. Manufrance was the first French mail order company, publishing an annual catalog from 1885. The company went bankrupt in 1979. In 1893 the company began to manufacture a palm pistol known originally as Le Mitrailleuse (usually translated as “machine gun”), but which was renamed to Le Gaulois within a year or two. This was a magazine-fed “palm -squeezer” that fired the existing 8mm cartridge used by the Turbiaux Le Protector rotary palm pistol. Manufacture of the Gaulois continued until 1911 or 1912. Sales of the gun declined steadily with the advent of true self-loading semi-automatic pistols, some of which were smaller and more easily concealed than the Gaulois. In 1912 Etienne Mimard began to design a new self-loading pistol. His pistol, unlike most others of the period, owed nothing to John M. Browning’s designs, but was quite original. It was patented on 6 August 1913 (French patent 472,505) and first appeared in the Manufrance catalogue of 1914. Proudly named “The French” pistol, or le Français, it remained in production until the company’s demise. Le Français is one of the simplest pistols ever produced. It has a minimum of moving parts, and several parts perform two functions. The primary components are the frame, slide, and barrel. The gun is blowback operated, double action only, with no extractor--the empty brass shell being ejected by residual gas pressure in the breech. Le Française has a tip-up barrel that opens automatically when the magazine is removed and will only close when a magazine is inserted. The round in the chamber is loaded by hand when the barrel is tipped up, as there are no serrations on the slide for retraction. There is a lever on the right side to open the barrel manually. The spring that works the barrel latch serves also to tension the magazine, and when the magazine is removed the spring relaxes and forces the latch lever down to release the barrel. The trigger guard serves as a spring that raises the barrel when the barrel release lever is engaged. When the barrel is open, if it is tipped further forward a lip on its underside lifts the front of the slide up so that it can be easily removed. Le Français has a very unusual recoil spring design. The spring itself is positioned vertically in front of the magazine well. Two L-shaped bell crank levers, one on each side of the gun beneath the grips, connect the recoil spring to the slide, providing a negative mechanical advantage of approximately 5 to 1, so the recoil spring is compressed only a very short distance compared to the movement of the slide. Originally, the pivot screw for the lever on each side also served as a grip screw, a laudable dual use, but its position at the bottom of the grip necessitated another screw toward the top, and removing the grips meant disabling the levers. Very early, the levers were redesigned, and a single screw was used to retain the grips. However, the screws that hold the bell -crank levers on the revised model extend outward from the grips, and the grip plates are hollowed to accommodate them--so the screws help keep the grip plates properly positioned on the grip. The early guns with the straight bell-crank lever and two grip screws are quite scarce. The trigger, connector bar, and sear form a single unit. The stirrup-shaped connector extends on both sides of the magazine. The unit moves freely in slots in the frame and is tensioned by a spring at the rear. Originally this was an S -shaped leaf spring, but after 1924 (between serial numbers 93,000 and 95,000) the leaf spring was replaced by a coil spring around a guide. When the trigger is pressed the sear moves to the rear, pulling the firing pin back with it, and the angle of the slots in the frame is such that as the sear reaches its rearmost position it is cammed downward, releasing the firing pin. Hence, the gun is never cocked except when the trigger is pulled and no further safety mechanism is required. The magazine is held in place by two short wings that extend laterally from the floorplate, which fit into notches in the bottom of the grip. The magazine is tensioned to the rear of the magazine well by the spring which also operates the barrel release lever. The two short wings are checkered on their ends, and the magazine is removed by grasping these wings, pressing the magazine forward in the grip, and pulling down. 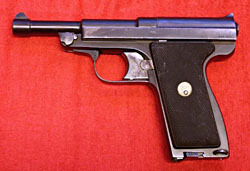 This method of retention was replaced in 1935 with a conventional magazine release at the bottom rear of the grip. The wings were retained in a slightly different form as a means of grasping the magazine for removal. Catalogue advertisements for the Le Français asserted, first, that most automatic pistols have serious drawbacks. If you carry them cocked, they are dangerous. If you don’t carry them cocked, they aren’t ready to fire when you need them. If they have a safety, you have to remember to disengage it. Most automatic weapons are weapons of attack rather than defense, and the person who is attacking has plenty of time to make his weapon ready, whereas the person defending must be ready instantly. Secondly, the advertisements assert that most automatic pistols are dangerous in that you can remove the magazine and easily forget to remove the cartridge in the chamber. This can’t happen with the Le Français because when you remove the magazine the barrel tips open. 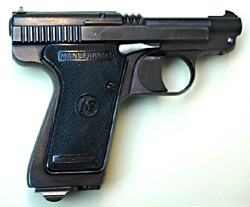 Prior to 1939, some guns in 6.35mm (both Le Poche and Type Policeman) were sold by Manumodèle, the wholesale subsidiary of Manufrance. These guns are marked FRANCO instead of ‘Le Francaise’ on top. The left side of the slide is marked FABRICATION FRANÇAISE. According to Doane, only the standard finish was available and there were no model markings on the barrel lug. Some guns are not marked ‘Franco’ and have only FABRICATION FRANÇAISE on the slide, leaving room for the reseller to add his own inscription. Total production of all types of Le Français pistols is estimated at about 250,000. According to Doane, approximately 210,000 of these were in 6.35mm (.25 caliber). 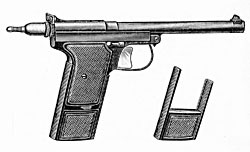 The 6.35mm poche or pocket model was the original Le Français design, introduced in 1914, with a 60mm (2.36 inch) barrel. With an overall length of 112mm (4.4 inch), it is easily concealable in pocket or purse. The magazine held seven rounds. The firing pin is held in by a plug at the rear of the breech with a hole in its center through which the back of the firing pin protrudes when the trigger is pulled. The plug is retained by bayonette-type lugs. According to Doane, the earliest plug is “short and flat on top.” The most common plugs are round and have a flat rear surface that is checkered; later plugs extend a bit further from the rear of the gun and have a smaller area of checkering. After WWII the plug extends further to the rear and flares, and the flared portion is checkered around its circumference. The front sight is integral with the barrel, and the rear sight is integral with the slide. There are no slide serrations. Early Poche models were available in four grades, from No.1 to No.4, with number 1 being the low-end unengraved model, and numbers 2 through 4 featuring increasingly elaborate engraving. All were blued. Later, with the advent of other models, each grade was given its own model number: 802, the standard model; 808, with improved finish, polished trigger guard, and minor engraving; 814, with nickel trigger guard, finely checkered grips, deluxe brilliant blue-black finish, and luxury engraving; and 820, the same as 814 but with further artistic decoration. In later years the model 802 was also offered in nickel finish. The model number is stamped on the barrel lug, visible when the barrel is tipped open. The serial number is stamped on the barrel, also visible only when the barrel is tipped open. “ LE FRANCAIS “ CAL 6.35 BREVETE S.G.D.G. On either side of the above inscription are two trademarks. On the left are two crossed cannons and an arrow pointing downward, with an M on the left and an F on the right. To the right of the inscription is a circle with MF in the center and SAINT curving above and ETIENNE curving below it. Late pistols are unmarked on the left side of the slide. Early Le Francais models have a grip frame with parallel sides and a magazine that is held in place by two short wings that fit into notches in the bottom of the frame (as described above). Intermediate models have a grip frame that is flared at the bottom rear, but still retains the floorplate magazine catch. Late models have the flared grip frame with a thumb-operated magazine release at the heel of the grip. The flared grip frame was almost certainly designed to accommodate the pin for the magazine release lever. In 1939 a number 812 extra light model (modèle extra-léger) was introduced with an aluminum alloy frame. The barrel, barrel latch, slide, trigger guard and magazine release were chromed steel. The grips were mother of pearl. The extra light model weighed 245 grams (the standard model weighed 320 grams). There was also a model number 811 with a fluted barrel, “lightning” cuts on the top of the slide, and mother-of-pearl grip plates. Production was halted by the war, so these models are extremely scarce. In 1965 four cooling fins were added to the breech of the Modèle de Poche. The plug in the end of the breech was enlarged slightly, but still retained the hole for the firing pin. The magazine was provided with a ring at the base to hold a spare cartridge to go in the chamber (like the type Armée--see below). The Poche with these features only appeared in the catalogue for two years. 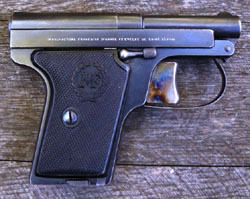 According to Cadiou and Richard, the Le Français was a standard issue sidearm for some officers of the French Criminal Investigation Department. In 1922 the 6.35mm type Policeman model was introduced. It had the identical frame and magazine as the Le Français, but featured a longer 87mm (3.42 inches) barrel, and had an overall length of 157mm (6.18 inches). The longer barrel made it slightly less concealable, but capable of greater accuracy . The plug over the end of the breech screwed in, rather than having bayonette lugs, and covered the firing pin completely, preventing the entry of dirt and lint. The rear sight on the Policeman, secured by a screw, doubles as a spring which engages notches in the breech plug to hold it in place so it does not come unscrewed. 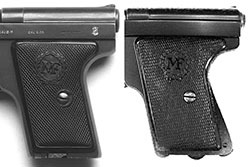 The Type Policeman was offered in four grades, similar to those for the pocket model. Originally these were Numbers 5, 6, 7, and 8, but later on model numbers were assigned: 826, standard model; 832, improved model; 838, deluxe model; and 844, grand deluxe model. “ LE FRANCAIS “ TYPE POLICEMAN CAL 6.35 BREVETE S.G.D.G. The right side of the slide is marked like the Poche model, as described above. In 1934 the magazine was provided with a ring at the base to hold a spare cartridge (like the type Armée--see below). Since there were no gripping surfaces on the slide, and a cartridge could only be inserted into the chamber manually, there was always a spare cartridge available with the magazine. In 1965 four fins were added to the breech. The type Policeman was produced until 1968. It was carried by some members of the National Forestry Service, though it was probably never used by police. Cadiou and Richard state incorrectly that the type Policeman was available in 7.65mm. The Type Policeman was serialized in the same range as the Modèle de Poche. The 6.35mm Champion was a target model that appeared in the Manufrance catalogue from 1926 to 1934 as the No. 10. It’s frame and magazine were identical to those in the earlier two models, but the Champion was equipped with a long 150mm (5.9 inch) barrel with precision rifling. A grip extension was provided to better fill the hand for target shooting--it did not increase the magazine capacity. The front sight was dovetailed into the barrel, and so could be adjusted for windage. The rear sight was screw adjustable for elevation. The long sight radius was said to provide excellent accuracy. The firing pin on the Champion was longer and heavier than on the other models, but came with a lighter spring. In addition, the firing pin was grooved so it could be pulled back manually, cocking the action. This allowed for firing in a single-action mode. 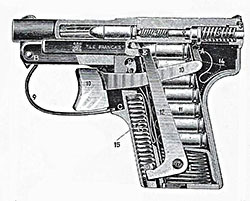 The greater mass of the firing pin provided sufficient inertia to ignite primers, but the light spring and single-action trigger allowed for a smooth, light trigger pull. The screw-in plug at the rear of the Champion was even more elongated than that of the Policeman, and was drilled at the rear to allow the firing pin to protrude through it. The No. 15 in the catalogue was a cased version of this gun with an interchangeable barrel chambered for the .22 long rifle cartridge. The .22 round could be fired in single-shot mode only (Doane explains that the .22 Long Rifle round was not powerful enough to work the action). The .22 barrel was bored off-center to allow the firing pin to strike the rim of the cartridge. The No. 15 was provided with a fake magazine to insert into the grip (since without a magazine the barrel would remain tipped open), and also came with a cleaning rod. Two different Model 15 Champion pistols are pictured in AutoMag, Volume CLVIII, Issue 9 (December 2015). Very few of the Champion pistols were made. I have rarely seen them offered in the United States. Stewart (in his 1973 Guns magazine article) indicates they are known to him only from catalogue illustrations, but Huon and Doane provide photographs. After World War I, the French General Staff set about upgrading their military weapons across the board. By the mid-1920s all major weapons manufacturers in France were working on pistol designs to submit for testing. 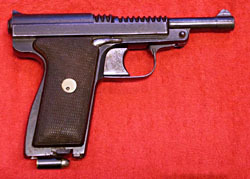 The Le Français type Armée, chambered for the 9mm Browning Long cartridge, was Manufrance’s submission for a military pistol. It was tested extensively between late 1928 and early 1933, but was not well received. A number of minor problems were encountered, but probably the major objections to the gun were that it was blowback operated, had no extractor, and was double-action only. According to Huon, some documents specify a reduced load for the cartridge--and the 9mm Browning long was already considered marginal. Huon characterizes the type Armée as, like all the Le Français pistols, essentially a defensive weapon and hence fundamentally unsuitable for military use. The barrel of the Type Armée was attached to the frame by a removable pin to allow for quick dismounting. The trigger guard no longer served as a spring for the barrel, but was anchored to the frame at its upper end. A tiny roller on the bottom of the trigger smoothed the action. A gas release vent connected to the firing pin channel, in case a perforated primer should release too much pressure at the breech. Grip plates were of checkered rosewood (later grips were checkered hard rubber), reinforced with a steel backplate. There were no grip screws--the bottom of the steel backplate fitted into a slot in the bottom of the frame, and the grips were held in place at the top by the slide. The magazine held 8 rounds. The gun was first sold in 1928 and was given model number 12 (later 850) for the standard model, model number 14 (later 856) for the deluxe finish version, and model number 16 (later 862) for the ‘Grand Luxe’ version. The word MANUFRANCE is stamped in a small oval on top of the slide. Early Type Armée pistols had a smooth barrel, like previous models, but in 1931 a number of cooling fins were added to the barrel (9 on the barrel proper, and 3 over the chamber). The updated version also featured a steel loop at the bottom of the magazine to hold an extra cartridge to go in the chamber. Only about 4,900 Type Armée pistols were manufactured between 1928 and 1939. According to Doane, the gun was given its own serial number sequence which began at 5000. Finned versions began to appear around 6000, but both finned and smooth versions were made for a time. The early version with the smooth barrel is scarce, and the deluxe and Grand Luxe versions are quite rare. Production ended with the beginning of World War II, and the Type Armée was never made again. A limited number of Type Armée pistols were wholesaled by Manumodèle, markedFRANCO on top and FABRICATION FRANÇAISE on the slide. These guns are quite rare. Accorcing to Stewart, guns of military caliber were forbidden to ordinary French citizens, so for many years the largest caliber they were allowed to own was .25 because the automatic pistols adopted by the French military in 1935 were chambered for the .32 French long cartridge. But this changed in 1950 when the French adopted the 9mm Parabellum, prompting Manufrance to issue their first .32 caliber pistol. The 7.65mm Model No. 846 first appeared in the 1950 Manufrance catalogue. None of this is mentioned in any of the French sources. 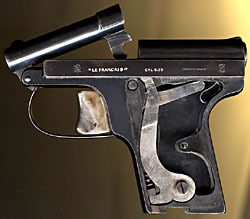 The 7.65mm Le Français was the first and only Manufrance pistol to have slide serrations or an extractor. It was made on a larger frame than the Poche or the Policeman--somewhat similar to the Type Armée. The barrel was 83mm long (3.27 inches). Total length was 152mm (5.9 inches). The trigger guard was integral with the frame. The magazine held eight rounds, and featured a release button on its base that was pressed from left to right. There were three cooling fins on the barrel over the breech. The barrel is retained by a manually removable pin like the Type Armée, and is raised by a small coil spring just behind the pin. The front sight is integral with the barrel, whereas the rear sight is dovetailed into the slide. There is a lanyard ring at the base of the grip on the left side. Grip plates are of checkered black plastic with “MF” in a circle at the center, “Manufrance” at the top, and “Saint-Étienne” at the bottom. The bottom of the barrel is marked BREVETE S.G.D.G. / CAL.7.65 with the two Manufrance trademarks described above on either side. The top of the slide is checkered and features the words LE FRANCAIS in an oval logo. The 7.65mm Le Français was possibly the best self-loading pistol ever made by Manufrance, but it came far too late to compete successfully with similar guns from other major manufacturers. Only just over 10,000 were made--production ended in 1965; however, the gun continued to be assembled from existing parts, and remained in the catalogue until 1969. This model was never exported, is rarely seen in the U.S., and sells at a premium not warranted by the quantity made but based entirely on its relative scarcity outside of France. The entire line of Le Français pistols was simple, well made, remarkably accurate, and--as the advertisements were careful to point out--always safe, but always ready. Their disadvantages were the lack of an extractor on most models, and a rather heavy double-action trigger. Additionally, the dual purpose spring that works the release lever and tensions the magazine is easily broken. J.B. Wood says this spring is easily made, but you must have the original to work from. Note: This article is based largely on Huon’s book Les Pistolets Automatiques Français, with some very good supplemental material from the other sources, particularly Stewart’s 1973 article, the 1931 Manufrance Catalogue, and finally an article by Colin Doane serialized in AutoMag, the news magazine of the National Automatic Pistol Collectors Association. Any errors are my own. Firearms Assembly/Disassembly, Part I, by J.B. Wood. Krause, Iola, Wisconsin: 1999. “In The French Manner,” by James B. Stewart. Guns, June 1973. French Service Handguns: 1858-2004, by E. Medlin and J. Huon. Tommy Gun, St. Louis: 2004. “Le Français Pistols,” by Colin Doane. AutoMag, November 2015, December 2015, and February 2016. Les Pistolets Automatiques Français, by Jean Huon. Histoire & Collections, Paris: 1995. Modern Firearms, by Yves Cadiou and Alphonse Richard. Chartwell, Secaucus, NJ: 1977. Special thanks to Alain at LittleGun.Be for letting me reproduce photographs of the type Armée & 7.65mm.